Here's a bookmark I've made for the Crafty Individual's August challenge with the theme of Bright and Beautiful. I was inspired by Helen Chilton's use of Stazon as a bright background - here I've swiped Cactus Green and Sunflower Yellow across a piece of glossy card and then dabbed Spiced Marmalade, Fired Brick and Stormy Sky Distress Inks through a handcut mask to create a sunset effect. 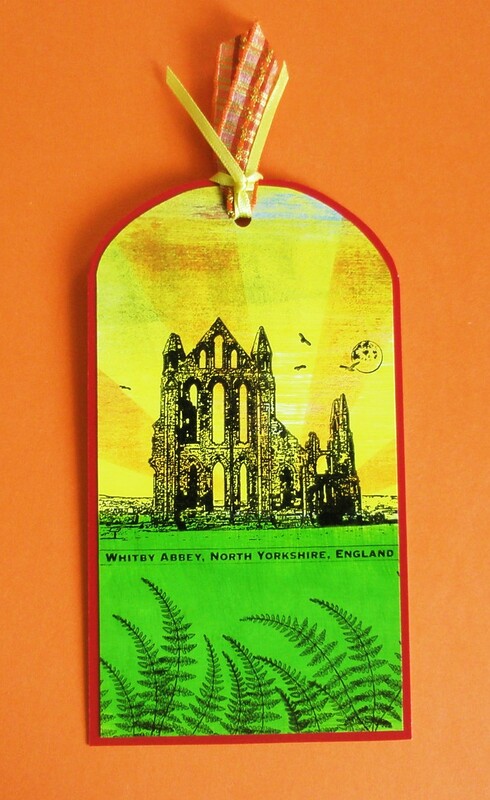 I've used Crafty Individuals stamps - Whitby Abbey CI227 and a bracken from CI207 - and tried to make it look as if you were viewing the Abbey across the moors. This is indeed bright & beautiful, great image too. Hi Elaine. What a fab bookmark. I really love how you have created the sunset. It looks great behind the image you have used. Thank you for visiting my blog today it was lovely to hear from you. a very bright bookmark, it's great~! Wow, that rocks, fantastic colors. A lovely tag you created.